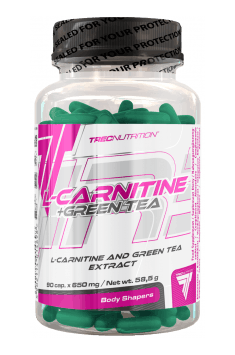 L-CARNITINE + GREEN TEA is a compound product that contains highly absorbed liquid L-Carnitine and concentrated Green Tea Extract in easy-to-swallow gel capsules. The active substances in Green Tea are strong metabolism boosters. They show thermogenic effects increase body temperature and intensify the efficiency of L-Carnitine. Thanks to the synergetic effects of the product ingredients more fat is used in energy production, which means that fat tissue burns much more quickly. L-Carnitine + Green Tea 90 caps. 4 capsules 30 minutes before training. 2 capsules 2 times a day, preferably 30 minutes before a meal. The recommended daily dose of L-carnitine is 500-2000 mg. Use the preparation during the periods of fatty tissue reduction and when you aim at maintaining current body mass. Synergistic effect of the ingredients causes the increase of fat participation in energy production, which considerably accelerates effective slimming. MCT oil; capsule shell - gelatin, glycerol; soybean oil; glazing agent - white and yellow beeswax; emulsifier - soya lecithin; carrier - silicon dioxide; color agents - titanium dioxide, tartrazine, brilliant blue FCF. L-carnitine fumarate forms a single molecule, constituting a combination of L-carnitine and fumaric acid, intensifying the efficacy of the individual components of the compound. L-carnitine in the natural form found in animal products, in the human body formed from essential amino acids (lysine and methionine), acting as a transporter of long-chain fatty acids into the mitochondria of the cell. The fumaric acid is an intermediate product in the Krebs cycle, involved in the production of energy. In the sports supplementation it is used by representatives of endurance sports in order to improve exercise capacity and as a dietary supplement for people on a slimming diet and vegetarians and vegans, in multiple-component supplements. Dosage: 1-3 mg daily (customarily in sports supplementation).